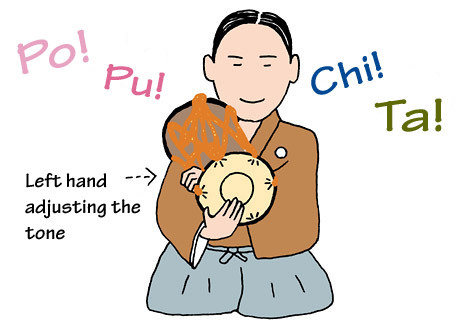 TRIVIA of Noh : Q72 : What are the basic sounds of the small tabor? | Home | Trivia | Q72 : What are the basic sounds of the small tabor? What are the basic sounds of the small tabor? If you ask people to describe the sound of the small tabor in words, many would say "Iyō, pom". Although the impression may be of such a sound, the complex composition of a tabor performance actually uses several different types of sound, as well as rhythmical pounding. The player places the instrument on his right shoulder and strikes the leather with his right hand. With his left hand, he holds tension strings between drumheads known as " shirabe-o". When the strings are held loosely, striking the tabor hard makes a strong and low "po" sound, while striking it lightly makes a weak and low "pu" sound. When the strings are held tightly, striking the tabor hard makes a strong and high "ta" sound; striking it lightly produces a weak and high "chi" sound. Sound differences also depend on exactly where the player strikes. There is another type of sound, "tsu," although this is used rarely. The rhythmic patterns of sound combinations of instrument and human voice are called tegumi. There are almost 130 patterns for the small tabor, and their usage is determined in detail for every piece.